The Selected Papers of John Jay is seven-volume scholarly edition of John Jay's correspondence and writings. The work consists of a wide-ranging selection of the most significant and interesting public and private documents and letters, written or received by Jay. The edition is designed to revise and complete work begun in the 1950s by the eminent Columbia University professor Richard B. Morris, who supplemented the major collection of original Jay Papers at Columbia with copies of Jay documents secured from archives throughout the world, and with his staff published two volumes covering the era of the American Revolution.The current project is sponsored by the Rare Books and Manuscript Library of Columbia University Libraries. Few leaders of the new American nation had more influence than John Jay (1745–1829), or could match his contributions in all three branches of government, at both state and national levels. A leading representative of New York in the Continental Congress, Jay became one of the American commissioners who negotiated peace with Great Britain. 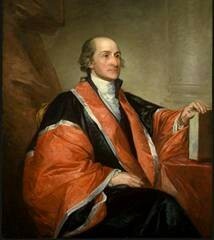 He served the new republic as secretary for foreign affairs under the Articles of Confederation, as a contributor to the Federalist papers, as the first chief justice of the United States, as negotiator of the 1794 "Jay Treaty" with Great Britain, and as a two-term governor of the state of New York. In his personal life, Jay embraced a wide range of religious, social, and cultural concerns, including the abolition of slavery. Jay's correspondents included such friends and associates as George Washington, John and Abigail Adams, Thomas Jefferson, William Livingston, Robert R. Livingston, Gouverneur Morris, Robert Morris, the Marquis de Lafayette, William Wilberforce, Jeremy Bentham, and William Grenville. While Jay’s peers recognized his profound influence as a statesman, many scholars of the American Revolution and early republic have depicted him as a man in the background. The Selected Papers of John Jay publication project is part of a larger campaign at Columbia to bring greater attention to Jay’s many accomplishments. Publication of this series will introduce a new generation of students and scholars to this founding father’s role in shaping the American government. It will place in context his domestic life and his legacy, including the roles of his articulate wife, of her extensive and influential family, and of their politically active sons, who solicited Jay’s advice in shaping their own careers of public service. It will also serve as a guide to the Papers of John Jay digital archive, which was launched in 2003. This website provides access to images of more than 20,000 pages of Jay and Jay-related documents, and is available free to the public here. The Selected Papers of John Jay is published by the University of Virginia Press. Volumes 1-4 have already appeared. The Digital Edition of The Selected Papers of John Jay will be published by the University of Virginia Press beginning in January 2015, as part of their America's Founding Era collection on Rotunda. The Selected Papers of John Jay is supported by the National Historical Publications & Records Commission (NHPRC), the National Endowment for the Humanities (NEH), and Columbia University Libraries. Addition support has been provided by the Peck Stacpoole Foundation, the Richard Gilder Foundation, the Florence J. Gould Foundation, and Columbia University Law School. Contact us and follow us on Twitter, Facebook, and our blog.